The third castle I came onto by pure chance. 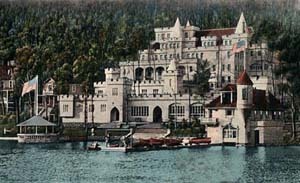 I was on Ebay when I noticed this postcard of a castle in Lake Hopatcong, NJ. I assume it was torn down, or burnt down or something. The only proof I can find of its existence is this postcard. While browsing your site for the first time - I heard it mentioned on CBS this morning, I saw the page on Castle Edward on Lake Hopatcong in NJ. My family has lived on the lake for many years and it was a grand place - unfortunately many of the old, architecturally interesting buildings have succumbed, mainly to fire, over the past 40 years. For additional pictures and information on Castle Edward, and many of the old buildings in the area, I'd recommend Hopatcong: A Century of Memories by Martin Kane. It's part of the Images of America Series published by Arcadia Publishing Co of Charleston, SC. Another source of information, if they can still be found, are old copies of the Hopatcong Breeze. Thanks to Sean Dermond for finding this photo.